Exclusive Discounts for Metro Riders | / Budget Insurance Agency, Inc. Located in the heart of Leimert Park, this family-owned business has been serving the community since 1966. They offer personal and commercial lines of auto insurance, SR-22 filings and affordable down payments. They also provide excellent customer service and the lowest rates available. Don't get caught without coverage. Call for a free quotation today. 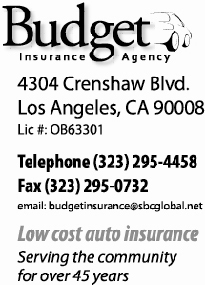 Budget Insurance Agency, Inc. is located at 4304 Crenshaw Blvd., Los Angeles, CA, 90008. Find your best route with the Trip Planner.